Space Biospheres Ventures (SBV), a 50-50 joint venture between Decisions Team, whose CEO was Margaret Augustine, and Decisions Investment, whose CEO was Edward Bass, bought SunSpace Ranch to build John Allen’s invention Biosphere 2. John Allen was made Executive Chairman and Head of Research, Development, and Engineering needed to create Biosphere 2. John Allen, Augustine Margaret, William F. Dempster, Abigail Alling, Mark Nelson, Deborah Parrish Snyder, Sally Silverstone, Mar van Tillo, Biospherians. 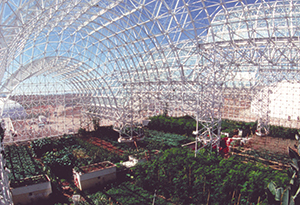 Biosphere 2 is an unprecedented, on-going ecological experiment. It is a tightly sealed glass and steel structure on 3.15 acres near Oracle, Arizona in which scientists have created seven complete ecosystems or biomes that mirror those of Earth. The systems include an ocean, a desert, a savannah, a rainforest, a marsh, an area of intensive agriculture and a human habitat.The project is designed to last for 100 years, providing valuable data for research and education to help scientists better understand how our world works. On September 26, 1991, eight researchers, known as “biospherians,” sealed the airlock on this massive enclosed ecological system – and Biosphere 2 was born. Following their 24-month adventure, these men and women will emerge from their mini-world on September 26, 1993. The experiment will continue with a new team of biospherians after a several month transition period. Biosphere 2 is a new type of laboratory which combines state-of-the-art architecture and mechanical and computer monitoring systems with a wide range of living ecosystems. It is an experimental project where everything that happens – both expected and unexpected – provides valuable insights into our complex and evolving world. While the biospherians further the research of more than 60 projects, 42 Ph. D.-level scientists are formally analyzing the information gathered inside Biosphere 2, as they study such topics as carbon dioxide and oxygen cycles, soil composition, coral reef health and vitality, agricultural pest management, waste and water recycling and more. Every two weeks, the biospherians send the samples they have collected through the airlock to scientific consultants and analytic laboratories for study. The four men and four women between the ages of 29 and 69 who live inside Biosphere 2 hail from the United States, England and Belgium. 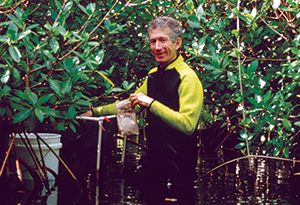 Their diverse backgrounds range from botany, agriculture and marine ecology to physiology, engineering and communications. Managing and conducting research withing separte biomes. Coordinating the biosphere’s technical system. Covering 3.15 acres, Biosphere 2 is the largest closed ecological system in the world. Located near Oracle, Arizona, the glass and spaceframe structure measures seven million cubic feet in volume and stretches up to 85 feet at its highest point. Its steel struts are covered with a finish that insures against corrosion from inside or outside the biosphere. All air, water and nutrient cycles are completely closed and recycled within this system. The monitoring of climate, air, soils and water within Biosphere 2 is unprecedented. Over 1,000 sensors distributed throughout the Biosphere send information to the sophisticated monitoring and control system located on-site at Mission Control. This elaborate computer network provides a continuous display of environmental variables and the status of engineering controls – while constantly updating the permanent data base. The ecological systems of Biosphere 2 include agriculture, a human habitat, an ocean, a tropical rainforest, a savannah, a marsh and a desert. Each different biome was built from scratch – with carefully selected soils, water and plant and animal life, collected from all offer the world. 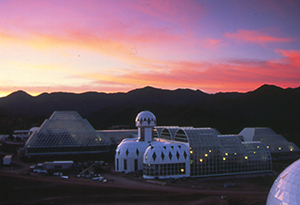 Biosphere 2 sustains high biodiversity with approximately 3,800 living species within its glass walls.